Like many fledgling breweries, Jeff Young and the group at Black Star Co-op are seeking out non-traditional ways of running a brewery—and a business. It was a purely emotional decision, he says, driven by a love of beer, brewing and community—three things in one package that struck the right chord. “I heard they were putting Flying Bike together and just had a gut feeling that it was something I needed to be part of,” says Flynn, a tech recruiting professional. Flynn is not alone. Around the country, startup breweries are adopting nontraditional business models and tapping their communities for the funds and sweat equity it takes to get a brewery off the ground. Cooperative breweries. Brewer co-ops. Community-supported breweries based on the CSA (community-supported agriculture) model pioneered by local farms. Crowd-funded breweries. They’re all on the map now, and it’s the engaged communities and individuals like Flynn who are the driving force behind a new generation of breweries. The alternative business models and community support are also allowing a new cadre of entrepreneurial and creative brewers to enter the profession who otherwise may never have been able to make that leap. While small breweries have always needed to be creative to stay viable, the increase in alternative business models and creative funding methods in the craft brewing industry are due to the success that craft brewers experienced in the past decade, says Julia Herz, craft beer program director at the Brewers Association. “The small breweries of today are now in a much different position than they were in the 1970s, 1980s and 1990s, because it seems like the financing is much more open and available because of the success of the overall segment of craft brewers,” she says. While the majority of these new breweries will take a traditional business route—starting a limited liability company, securing a bank loan, mortgaging a home, etc.—many are tapping into their communities to get their dream off the ground. Tim Dery was just another homebrewer in Seattle in the summer of 2010 when he read on a local beer blog about a meeting for individuals interested in creating a cooperative brewery in the city. Besides daydreaming about owning his own brewery—a blue-sky idea shared by every homebrewer at some point—Dery had never seriously considered the idea. But he was intrigued by the idea of a cooperative, which according to the International Co-operative Alliance, is an autonomous association of persons united voluntarily to meet their common economic, social and cultural needs and aspirations through a jointly owned and democratically-controlled enterprise. However, Flying Bike is not blazing new ground. Black Star Co-op Pub & Brewery in Austin, TX, opened in September 2010 as the first cooperative brewpub in the United States—and, as far as anyone can tell, the first in the world, says Jeff Young, Black Star’s head brewer. 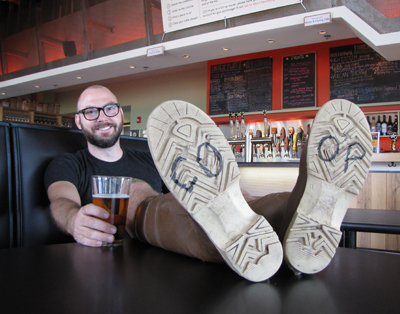 Young, a professionally trained brewer, had just moved to Austin from Alabama in 2006 when he attended one of the co-op’s organizational meetings. Initially, he didn’t even know what a co-op was, but he believed in its basic tenets. “It basically put a name to what I wanted to do, which was have some sort of brewery or brewpub that worked very closely with the community and the owners and take some of the production or the design of the beers, take some of that responsibility and spread it around and get more input, and feedback, and help,” Young says. It was a slow process, and one without a playbook. It took three years to get the co-op organized and functioning, and an additional two years to build the brewpub, Young says. He acknowledges there were doubts as to whether the cooperative model would even work, but a core group remained committed to the idea. The Bellingham Beer Lab already has five startup breweries committed to the project, including Parker’s, Happy Valley Brewing, which will share production space and a tasting room. The co-op doesn’t have a location yet, but Parker is hoping to have one secured in the latter part of 2012. Even breweries with more-traditional business models are realizing the greater role communities can play in their business. Page Buchanan, a former homebrewer, launched House of Brews in August 2011 in Madison, WI. To fund the venture, he followed the well-trod, though risky, path of many aspiring brewers. He secured a Small Business Administration loan, took out a second mortgage on his house, sold bonds to family and friends and reached into his own pocket. Currently, the brewery is up and running with keg-only production, which he supplies to local bars. But a farmer friend in his local homebrewers club turned him on to the idea of selling CSB shares. “It seems so obvious that I can’t believe that more people hadn’t thought of this before,” he says. He plans to sell six- and 12-month shares to customers, which would provide the subscriber with the equivalent of two or four kegs, respectively. He hasn’t started selling them yet, but already has a waiting list. Other CSB startups around the country include 7th Settlement in Dover, NH, and Big Beaver Brewing Co. in Loveland, CO. However, Buchanan points out that a brewing co-op might not be legal under some states. Cox and his partners changed direction, and chose a more traditional route. While they gave up on the co-op model, they didn’t give up on the underlying spirit of the co-op when they founded Community Beer Works. “Even though we are your basic LLC, we definitely aim to emulate a lot of the practices your cooperative business would normally endorse,” says Cox, CBW’s president. And though Cox and his partners couldn’t recruit member-owners, they could still source a portion of their startup funds from the community. They produced a video that introduced themselves and their plan to build a community-supported brewery in Buffalo and posted it on Kickstarter.com, a website that allows organizations and individuals to propose projects and seek donations from the public. In return, donors receive gifts, the poshness of which depends on the amount invested. For a $10 investment, CBW offered a CBW sticker, the right to sign your name on the wall of the customer service area, a tour of the brewery and free high-fives from the CBW owners. For $1,000, investors received an invite to an exclusive brewmaster’s dinner. CBW asked for $15,000 in total, only a fraction of the $160,000 Cox estimates the business launch will cost, but still a good chunk of startup funds. Exceeding expectations, CBW raised more than $17,000 in 20 days from 237 donors. “That really confirms to us that we’re not going to have any trouble selling this beer, if there’s that much interest and it was that easy to raise that money,” Cox says. As of December 2011, there were 21 breweries that were either actively soliciting funds on Kickstarter or had already met their funding goals. While Community Beer Works asked for only $15,000, some breweries—Pipeworks Brewing Co. in Chicago, Mystery Brewing Co. in Hillsborough, NC, and Wilderness Brewing Co. in Kansas City, Mo.—have each successfully raised more than $40,000, a significant chunk of startup costs. However, raising funds through Kickstarter is in no way a sure thing. Several brewery projects had failed to meet their Kickstarter funding goals, which means pledged donations were returned. Breweries owned and operated by the community are also more apt to offer educational and incubator-type opportunities. Just because Flying Bike doesn’t have a brewery yet doesn’t mean it hasn’t been busy getting the community involved. It held its first homebrew contest in September 2011—“we’re in Seattle, so of course it was an IPA,” Dery says—and out of 35 homebrewed entries, members chose one IPA as winner. A local brewery, Three Skulls Ales, produced the beer, called Fly PA, and it was available on tap in the Seattle area for several months, Dery says. The relationship between craft breweries and their communities is really at the root of the entire craft beer movement, but it’s undergone a long evolution and almost a role reversal. In the past, craft brewing’s pioneers put everything on the line to build craft breweries without knowing if the community would support the endeavor. They stood up against the macrobreweries and courted their local communities by consistently brewing a stellar product. It wasn’t always smooth sailing, but judging by the fact that craft beer sales are up even in the face of overall declining beer sales is a good sign that communities have embraced their craft brewers. Now, the pendulum has swung the other direction, and it’s the communities and their growing demand for craft beer that is driving a new generation of craft breweries staffed with individuals like Dery, Young and Parker, who without their communities may never have had the chance to brew their beer outside their own kitchen. And that can only be a good thing. Whit Richardson is a writer, traveler and beer enthusiast who lives and works on the coast of Maine. This time we are exposed to this rampant ignorance on Reddit, one of the social media platforms where people ramble on about whatever. Some character, whose reddit handle is just five numbers, three zero something, went on a rant about how too many tap handles in local bars and pubs are going to local beers. Here’s a list of Brewpubs organized or organizing as Cooperative Enterprises – Black Star Co-op Pub & Brewery, High Five Co-op Brewery, Fair State Brewing Cooperative, San Jose Cooperative Brewery and Pub, 4th Tap Brewing Co-op, Fifth Street Brewpub, Yellow City Co-op Brewpub, Flying Bike Cooperative Brewery, Los Alamos Beer Co-op, Bellingham Beer League, Miami Erie Brewing Co-op, Burlington Beer Works, and probably more will be joining this list. All of these are owned or to be owned by the consumers or workers of each company when they have reach their objective. I’m a member of the San Jose Cooperative Brewery and Pub. I’m really happy to see the spotlight on Cooperatives more and more. It’s a great model for a brew pub, which really should be a member of the community anyway as pubs were traditionally. The cooperative model really gives the local community a chance to be a part of an integral fixture in their community, the local pub. I look forward to seeing this movement grow and expand. Keep drinking beer, and maybe soon you’ll find a cooperative brew pub in your neighborhood as too. I am in a relatively rural area that is county near two small cities…I want to build a shop / brew hall and start a non-profit coop for the donut hole neighborhood that we are in….how do I do it…first steps? I know build the shop is first….